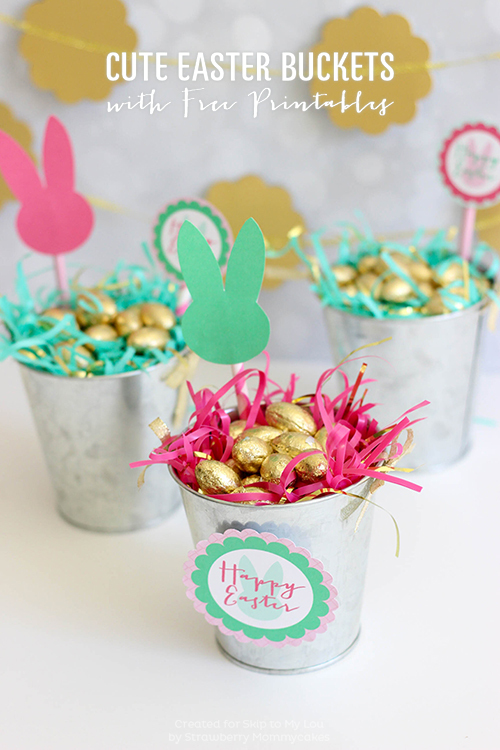 Create these EASY and Cute Easter Buckets (plus, I’ve included some FREE Printables!). 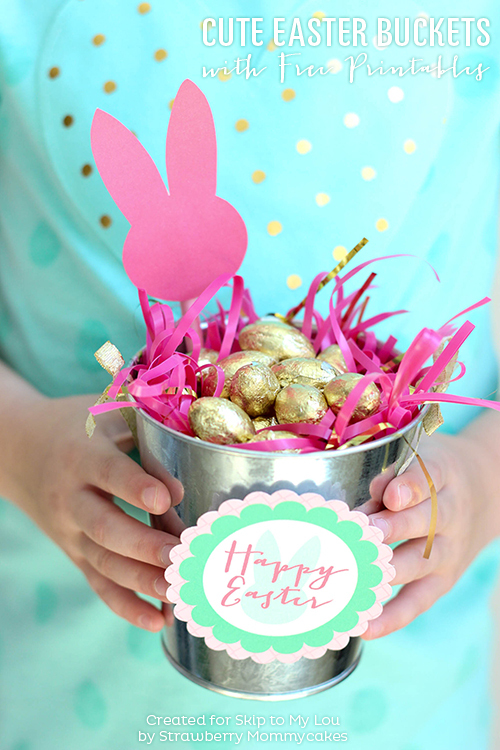 Easter is full of springtime themes and fun activities for kids – and candy – and these buckets are a nice twist on Easter baskets for kids. They make perfect Easter gifts. I’m always excited for Easter because we have a big break from holidays after Christmas. Don’t get me wrong… it’s a much needed break, but I still love preparing for each holiday and Easter is no exception! 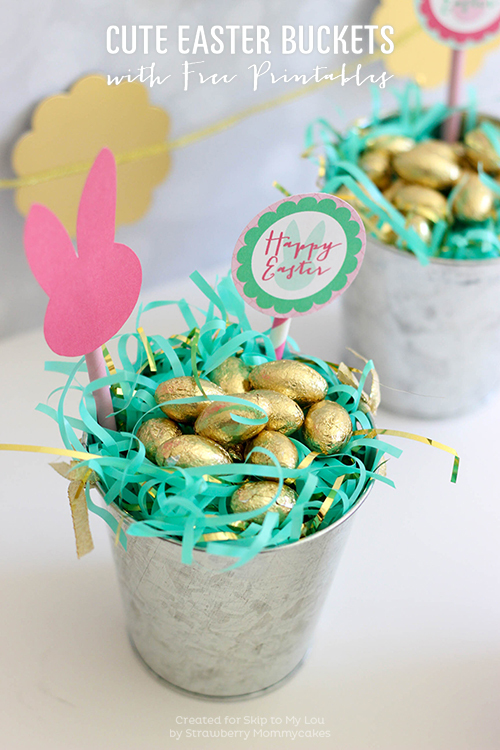 I think this is going to be the year of the chic Easter basket because gold is popping up EVERYWHERE! I decided to join in on the trend with these cute buckets! The printables are very versatile, though, so you don’t have to stick to the trend if you’re not a big fan of gold. 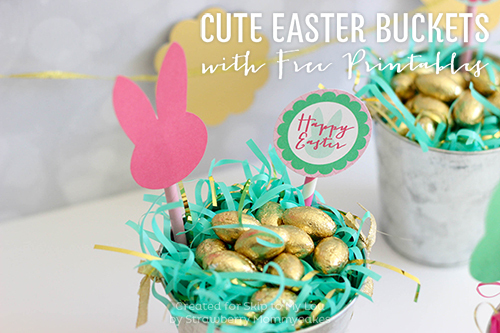 These simple printables are a great, super easy way to create personalized Easter baskets, favors, and buckets. You can print as many of them out for personal use for free as you want, then add them to your Easter dinner table decorations, use them as gift tags, and more. First, download and print the printables on heavier card stock paper. Next, cut out the bunnies with scissors and the circle tags with hole punches, then attach them to matching paper straws with glue or tape. The buckets I bought already had a ribbon tied to them – I removed those ribbons and tied metallic bows on the sides instead. Now you’re ready to fill your buckets with Easter grass and candy and insert the straws down the sides of the buckets. 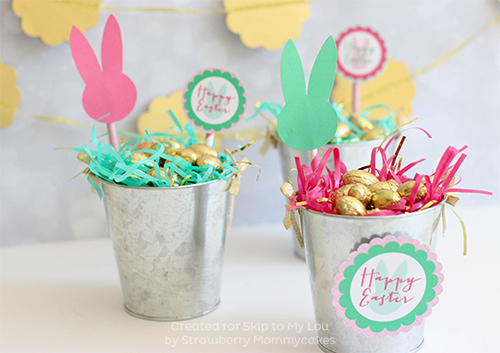 You can also print out the large Easter tag and attach it to the front of the buckets using the tape or hot glue. Whether you include the straws or affix the tags to them, I think they’re adorable. And if you’re making a bunch, it’s so cute to mix and match so you’ve got a whole variety to choose from! Are you looking for more easy and creative ways to personalize Easter gifts, decorations, and holiday food? We have so many craft projects, fun kids’ activities, and recipes! Want to fill your Easter buckets with gorgeous, hand-colored eggs? Check out our ultimate how-to guide to dying Easter eggs for instructions on how to make the most vivid eggs using food coloring, plus more amazing methods for decorating eggs. We’re loaded with Easter dessert recipes and simple treat ideas to make your spring parties extra special! You might be interested in these easy Bunny Cupcake Wrappers, or our favorite Easter Cupcake Picks — delish! The small handmade touches can add so much of a festive spirit to your Easter dinners. And if you have children who love to color, be sure to browse our free Easter printables! We have so many Easter coloring pages and printables for the kids’ table – just download, print, and color! Kids will love to take home a coloring page (or five) to showcase their art on the fridge and remember the fun time they had for Easter. Erin runs the blog Strawberry Mommycakes and is a mom to the three cutest kids ever, and the wife to the most patient and supportive man ever…okay, he’s pretty cute, too! When she’s not designing or watching her kids, she’s probably cleaning, cooking, reading, playing on Pinterest, or going for a drive and drinking a Pepsi…because Pepsi is awesome.